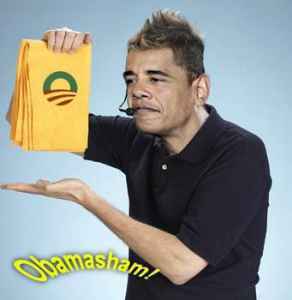 Deeds Summoned By Obama To Follow President's Orders and become Obama Lackey | Virginia Right! For months now, Democratic nominee for Governor Creigh Deeds has shucked and jived around the state avoiding Obama and his falling poll numbers like the plague. Obama is in Northern Virginia, Deeds heads west. Obama is in Southwestern Virginia, Deeds runs east. Deeds is well aware that the major reason for the 14 to 15 point deficit in the polls is the baggage from the irresponsible policies and Socialism being pushed by Obama and Pelosi. Apparently, Obama decided that it was time to call Deeds back into the Socialist fold and the tax and spend frenzy the Democrats are hell bent on pushing as far as possible. Deeds will be forced to bow to Obamacare, Card Check, Cap and Tax, and more wasteful spending. Now, if anyone thinks this is a free and open Town Hall meeting, I have a crumbling bridge in almost any state to sell you. This will be a hand picked audience, with pre selected questions and an Obama love fest combined with a Sham-Wow commercial. Slick Hollywood production styled drivel. This is exactly the type of phony, staged event Helen Thomas and Chip Reid were complaining about. And this should cast aside any doubt as to the future of Virginia should Deeds be elected Governor. He will not answer to the people of Virginia. His Chicago-style marching orders will come directly from the White House. Virginia needs to erect a fire wall between Washington, D.C., not give Obama free reign and a blank check. Tomorrow’s event will prove once and for all Deeds will be nothing more than a boot licking Obama lackey, and to hell with the citizens of the Commonwealth of Virginia. Private health care is what has made the American system the best in the world! Long live private health care!